Pledge to look smart and dashing this winter. Give up those summer T-shirts and hoodies. Go for sleeveless cardigans and the new range of long sleeve mens t shirts that top retail brands bring you today at a much affordable price range. Stylish and with a suave feel, these long sleeve tees for men are the complete winner that vouch a perfect dapper appearance. While they have always been a foremost choice for many, the new varieties introduced this season, if anything, are even better. Right color variations, unique patterns, and standard fit—all these combine to add a sporty flavor to the latest long sleeve mens t shirts. This makes them even more appealing, targeting, successfully, the lads who adore casual appearance over something bold and eye-catchy. Aside the overall winning look, these tees are just as flattering in the quality department. Crafted using premium quality, easy-stretch fabric material, they feature active wicking and ventilation properties. Also with temperature regulating mechanism, these tees assure to keep the wearers at their comfiest regardless the season. The biggest USP of the new range of long crewneck sleeve tees—a reason why they have a wide mass appeal—is their price tag. They are priced very affordably, ensuring the customers get more than the maximum value for their money. This season is bringing with it a host of new trends. And to stay ahead of the fashion crowd, you must bring your A-game on the scene. Layering hoodies and summer graphic-rich tees is a great option—but it’s an outdated look that basically every man sport during winter. Go with a different and dapper look this fall. 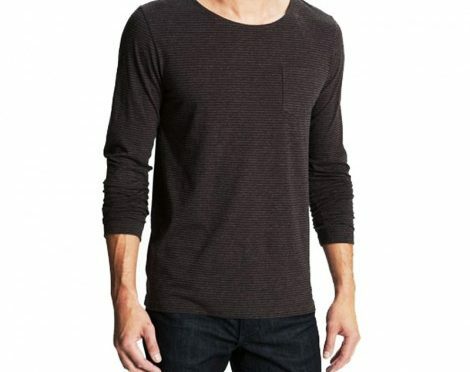 Grab from a large collection of new varieties of long sleeve mens t shirts the right piece that matches your own comfort and styling need. Pair it up with sleeveless cardigans. And seal a perfect appearance with your favorite denim pant and sneakers. Previous PostThe Wholesale Shorts Worn By Celebs Reflecting Fresh New Dashing SilhouettesNext Post3 Varieties of Gym Jackets That Can Enhance Your Workout Experience!